A simple Python program to simplify control of the AcerHK radio's --- Wifi and Bluetooth. It enables users to turn on / off the Bluetooth and Wifi Radios. It depends on the AcerHK driver to function. is this only for acer laptops ? anybody used this on IBM thinkpad X61 ? I am presently releasing version 0.4 of this program. Still a work in progress. — previous comment about IBM, well, if it uses the acerhk driver (see if it is installed at /proc/drivers/acerhk ) if it isn’t, then this program won’t work. I recommend that you check out the rfswitch project on source forge. They have a listing of various laptops and how to control the application. Version 0.5 is now released. – Added support for modprobe for module (acerhk) if not loaded. – Acerhk Driver Info is now provided in the preferences dialog. Would you please add a link to my project and my page on here in your main story. It is also a GTK GUI now and the interface is refined and much better. If you could update the screen shot also, that would be much appreciated. I believe my program — acerhkgui v. 0.6- can help a lot of users. I’d also like to get your feedback on the program. To fully test, it would be good if you removed the acerhk from your modules file before running acerhkgui. Also, Please provide me feedback on the functionality and what ways I can improve the current functionality. Used this on an Fujitsu Siemens Amilo li2375 – works brilliantly, must recommend anyone with this hot key problem to give this one a try instead of messing around with acerhk alone which takes quite a while to setup compared to this and i had to set it to run wireless always before unless i used a script, this is truly a step forward in compatibility. Gotta love ubuntu. I have just posted version 0.7 on SourceForge. This release will download and install a 32-bit compiled version of acerhk.ko. Hopefully this will fix problems that some users have had with the upgrade to Ubuntu 9.10 (which somehow dropped the acerhk.ko module). There is a bug in the code and I can’t seam to figure out how to get the computer to process the last stage of the driver install. 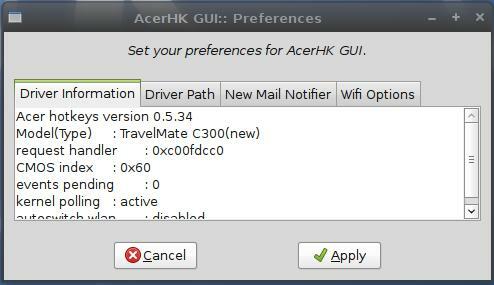 Please see the ubuntu thread on the Acer HK Gui above which will have the command required to get the driver recognized after re-running it. Draw back is it still requires a network connection to make that happen each new kernl upgrade. Version 0.7.1 is BETA. Main change is to “attempt” to automate installation of the acerhk.ko file. This beta requires build-essentiala and headers. It is hopefully smart enough to download source, install required dependencies, compile driver and install it. This should now work for both 32 and 64-bit systems. If you download the beta files posted at the following link, please provide feedback. > Now downloads and installs from source. Dialogs in Beta not updated to reflect that it should work on a IA64 system. > Made dependency Python as opposed to “python2.5”, so should hopefully help some of the issues. I really need feedback on this to see if the new code is working correctly. VERSION 0.7.2 is now released. It fixes the issues with the driver not compiling properly under Ubuntu 10.04. The source files for the ACERHK driver are also listed there, as they required some modification to compile properly. Finally, there is a stand-alone script that could help some people if all they want is the acerhk.ko module compiled. Previous links to the 0.7.1 BETA are no longer up.